Useful Things, Beautiful Things: Films, fashion and faux pas. I just love the Oscars. I love the films, the fashion, the personalities - the whole over-the-top glamourous splendour of it all. The live broadcast is in the middle of the night here in Britain but I don't care. I stay up all night wrapped in a blanket, eating popcorn and watching it all. Sandra Bullock was another treat this year. I thought her outfit was one of the best Oscars outfits ever. That gorgeous Marchesa gown would look even better on me, (in my dreams!) but no matter, she looked exquisite. The beautiful, delicate embroidery on the bodice and the shimmering, metallic fabric just took my breath away but I think that the final touch of genius was the fuchsia lips. The obvious choice would have been a pillar box red but the pink made it fresh, youthful and modern. Another surprise was Kristen Stewart. Her habitual surly glare to camera really gets my goat, (smile, girl, do you know how many people would kill to be in your position?) but last Sunday she actually managed to not only crack a smile but finally lose the irritating rebellious teenager attitude. However, my favourite person of the evening was the incomparable Gabourey Sidibe. I love the normalness of her. Yes, she's made some slightly duff fashion choices here, (the colour does nothing for her complexion and that applique across the waist & on the neckline only serves to broaden her) but who hasn't made some bad sartorial choices? She's brimming with joy just to be at the Oscars and I love that. 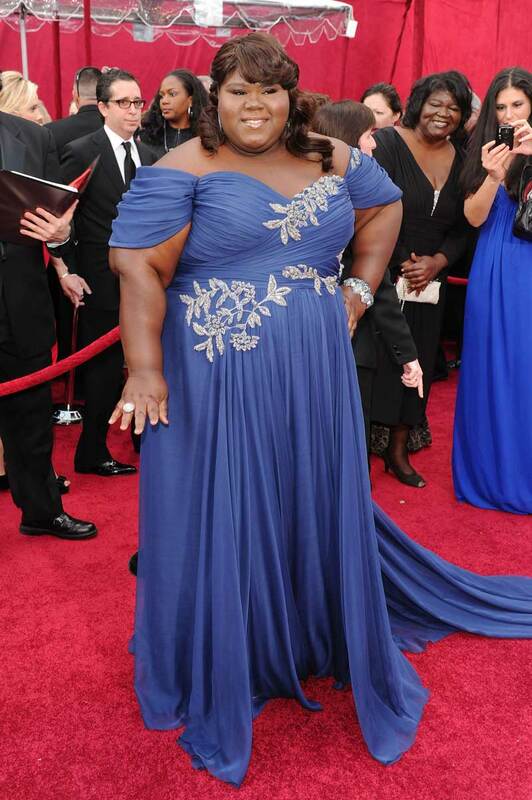 If I ever got to go to the Oscars, (yea right), I'd be the Gabourey of the show. In the absence of any real faux pas this year, I'm going to leave you with my favourite from times gone by - Bjork from the 2001 Oscars in her infamous swan dress. I thought it was a super-excellent Oscars this year-- I'm totally behind you about Sandra's dress- some bitchy queen over here said it was "matronly." What!??!?!!? As for "The Hurt Locker"-- my advice is to rent it-- it's not that it's all that bloody-- it's really not. but it is EXTREMELY intense and nerve-wracking. I saw it on DVD-- I can't imagine actually sitting in a theater and watching it. it's such a waste that kristen stewart can't stand straight in her dresses, she's always bent in two, looks like she's uncomfortable ! Thanks for the advice about 'The Hurt Locker'. I'll bear that in mind. Hi ElodieVeryPetit. Yes, I agree, Kristen Stewart always looks uncomfortable!